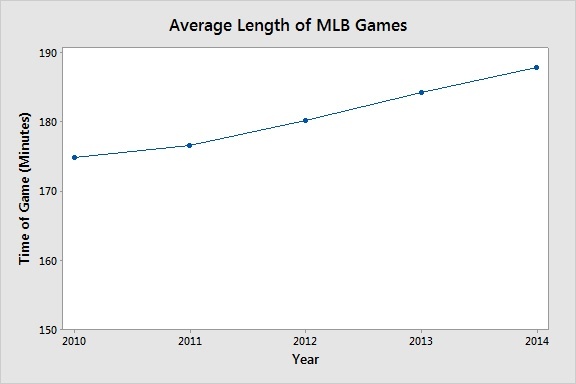 Time of Game: Are MLB Games Getting Any Shorter? As games have been lasting longer, there's been a feeling shared by many that this was a negative. Games seemed to drag on, with a lot of unnecessary stoppages and breaks. To combat this trend, and to try to speed up games to make them more accessible to casual fans, a few different rules have gone into effect this year to help increase the pace of games. First, the batter is now required to keep one foot in the batter's box at all times (with a few exceptions). 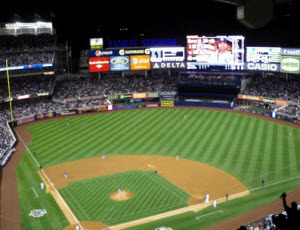 Additionally, there is a clock that runs between innings and pitching changes to make sure that the game restarts in a timely manner. But are these rules having an effect at all? We can look at the time of game data for games played in the first month of the season, and see if the games have been any shorter. 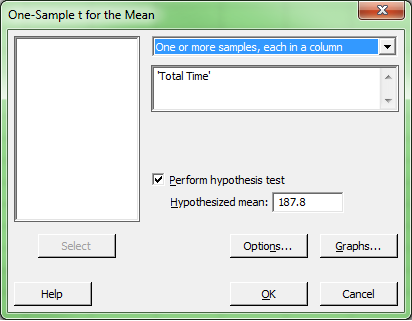 We can use a 1-sample t-test within Minitab to determine if the average game length is less than a certain hypothesized value; in our case, we can look and see if it's less than last year's average. We check the box to perform our hypothesis test. The hypothesized mean we're testing against is the average time of game (in minutes) from 2014, which was 187.8. Now we want to click 'Options' and change our hypothesis to "less than." Why? A one-tailed test allots all of our alpha to determining significance in one specific direction. In a one-tailed test, we are testing the possibility of a relationship in one direction and ignoring the possibility of a relationship in another. Statistically, by not looking for an effect in one direction, we have more power to detect an effect in the other direction. In this case, we are ignoring the possibility that the mean time of games may be greater than last year's. Look at the mean, and the upper bound. The mean time of games played so far is about 177 minutes, almost a full 10 minutes shorter! The upper bound indicates that we are 95% confident that the true mean is less than 180 minutes, clocking in at under 3 hours. Based on early season results, it appears that the new rules are definitely serving their intended purpose. What hypotheses—sports-related or otherwise—could you use a 1-sample t-test to examine?